Elementary students learn about gardening and agriculture at UKREC. Video by Jeff Franklin/UK Ag Communications. PRINCETON, Ky. (June 11, 2018) — Students in Lyon and Caldwell counties recently spent some of their final days before summer vacation learning about crops, insects and diseases at the University of Kentucky Research and Education Center in Princeton, Kentucky. The fourth- and fifth-graders participated in a project led by Zenaida Viloria, UK horticulture research analyst, which allowed them to take information they learned at the center and directly apply it to gardens at the school and at their homes. The project was funded by a UK Sustainability Challenge Grant. Viloria worked closely with Abby Smith, a fourth-grade teacher at Lyon County Elementary School, and Laura White, assistant principal at Caldwell County Elementary School, to develop a program that was not only fun for the children but reinforced concepts they learned in class. This spring, students learned earthworm composting, energy conservation, different types of plants, insects, diseases and soils. “We dug into the different educational standards to find the things we could do out here and back at the school to create a meaningful experience for these kids, so it’s something they can remember for many years to come,” Smith said. Viloria partnered with the schools to build four raised-bed gardens at each school. Students filled the raised beds with a variety of vegetables. 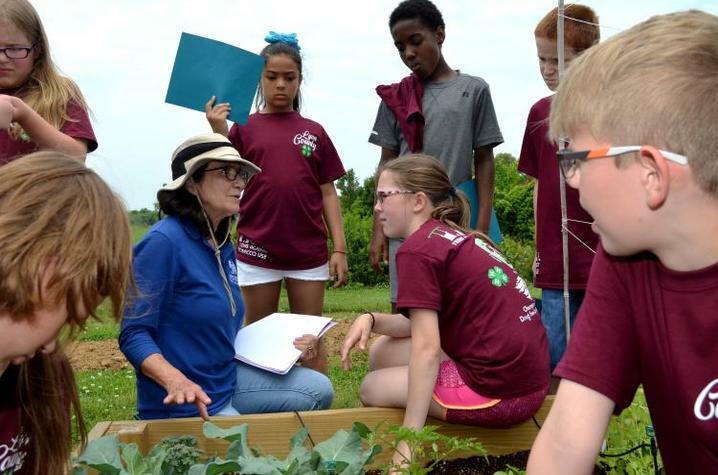 Fourth- and fifth-graders from each school came to the center twice this spring to learn about different topics related to gardening and horticulture from UK faculty and staff. Susan Fox, Lyon County agriculture and natural resources extension agent, the Lyon County Master Gardener Association and entomology graduate students contributed to the outreach project. Students from each school will return to the center twice this fall. In the meantime, students and school personnel will maintain the beds throughout the summer. The project was an opportunity for center personnel to directly engage young people in Western Kentucky and get them excited about science, gardening and agriculture and maybe interest them in pursuing a career in a related field. This is a project that many students like Lyon County fourth-grader Jenna Coursey are excited to continue. Zenaida Viloria, UK research analyst, with young students. Photo by Katie Pratt, UK Ag Communications.